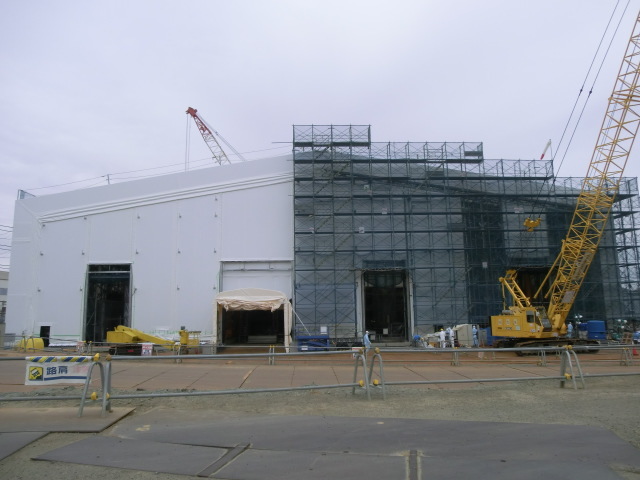 TEPCO was counting on the multi-nuclide removal system ALPS (Advanced Liquid Processing System) to be operational in the summer of 2012, so that the only remaining radionuclide in the water going through the treatment cycle would be tritium. 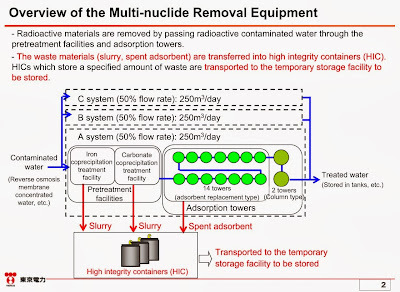 The system, advertised as Toshiba's system but in fact developed by EnergySolutions based in Utah in the United States, was supposed to remove strontium and a host of other alpha, beta and gamma nuclides that still exist after cesium absorption (by SARRY and Kurion) and desalination (reverse osmosis, mostly). Then around October this year, I started to hear that there would be another set of ALPS to accelerate the treatment. But then in November, I read a magazine article in which a researcher said the current ALPS was not capable of effectively removing strontium, and an entirely new system needed to be developed. 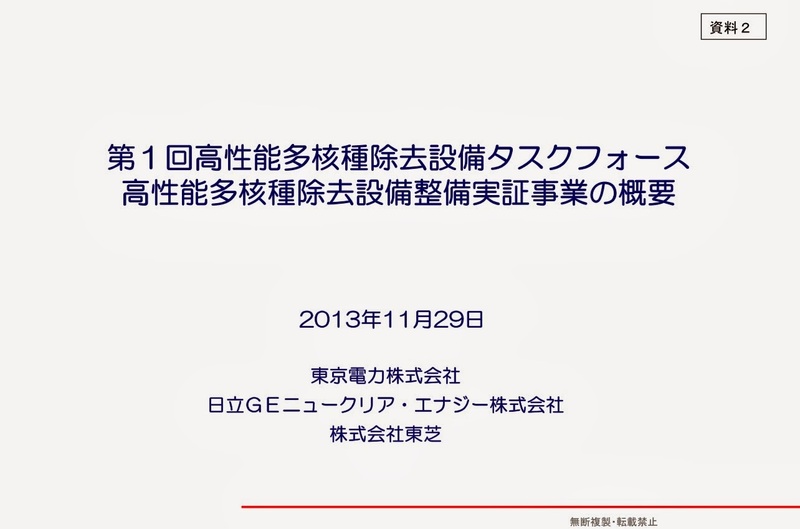 This document (available only in Japanese) is from the first meeting of the task force on November 29, 2013 at METI. I believe it was a closed meeting, and there was no news coverage as far as I know. 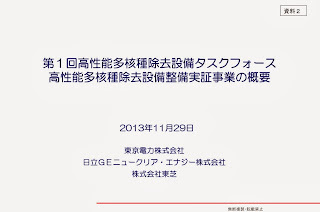 The presentation is, as often the case with TEPCO's, a fine example of how not to make a presentation as each page is jammed with information some of which does not belong on the page. So I'm doing my best to piece together a cohesive story here. 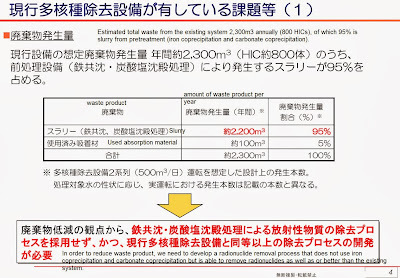 Take note of the "Pretreatment Facilities", made up of iron coprecipitation and carbonate coprecipitation systems, and producing highly contaminated slurry as waste product to be stored in the "high integrity containers (HIC)" (I believe it was these containers that NRA wanted tested for integrity by dropping from height). "Estimated total waste product from the existing system is 2,300m3 annually (800 High Integrity Containers), 95% of which is the slurry from pretreatment (iron coprecipitation and carbonate coprecipitation)." "In order to reduce waste product, we need to develop a radionuclide removal process that does not use iron coprecipitation and carbonate coprecipitation but is able to remove radionuclides as well as, or better than, the existing system." Uh oh. 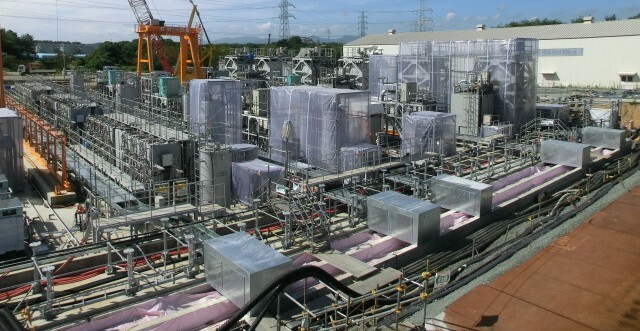 After paying Toshiba and Kajima (construction) a ton of money to build a huge system (see the photos below) that is not even in full operation yet, they need a new one because the current one produces too much waste. What I don't understand is that they, particularly Toshiba who picked EnergySolution's technology, should have known from the very beginning that the current ALPS system would create a large amount of slurry from coprecipitation process, much like the decontamination system by AREVA that use coprecipitation process (AREVA's system was stopped and practically abandoned when too much, highly radioactive slurry was created as the waste, on top of numerous technical problems). But wait, it is not just about the amount of toxic waste that the existing ALPS is not performing to expectations. It's also about how it removes radionuclides. 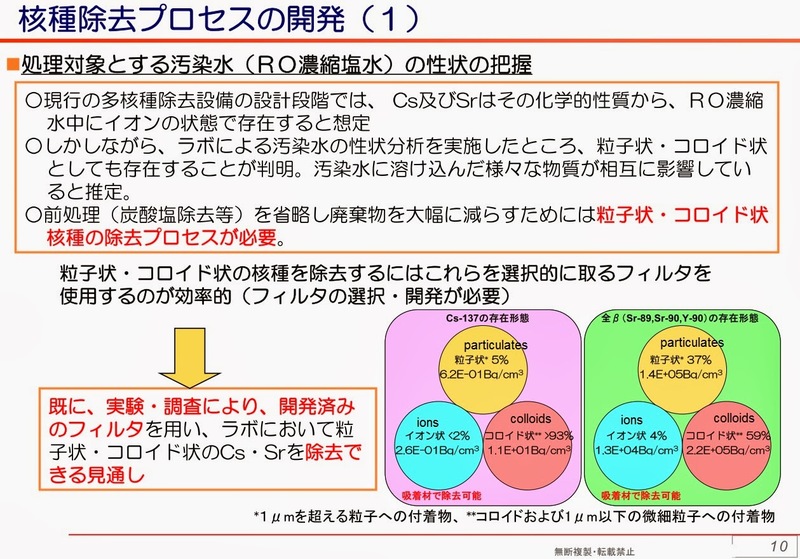 From the document at METI, TEPCO/Toshiba(/Hitachi-GE) thought radionuclides, particularly cesium and strontium, existed in the contaminated water as "ions" at the time when the current ALPS system was being designed. However, it turns out that the nuclides exist in the contaminated water mostly as "colloids" and "particulates", not "ions". The existing ALPS system is fitted with ion-exchange media from the Finnish company Fortum. Uh Oh. 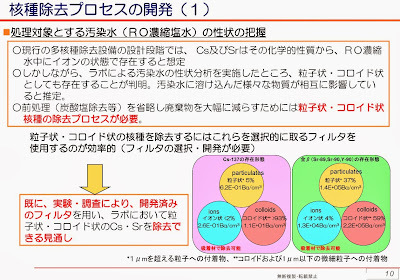 More than 93% of cesium-137 in the post-RO (reverse osmosis for desalination) waste water exists as "colloids", less than 2% as "ions" and 5% as "particulates". 59% of all beta (strontium-89, -90, Y-90) exists as "colloids", 37% as "particulates", and 4% as "ions". The existing absorption materials (in vessels) can only remove these nuclides in "ion" form. The nuclides in "colloids" and "particulates" are removed by the pretreatment process, thus the large amount of slurry waste. So now, after two full years of building and testing the ALPS, it is obsolete even before it reaches full operation. At least this was on TEPCO's own money, not the taxpayers' money, though I feel sorry for the workers made to work in a high-radiation environment. This does not sound like a fatal defect, rather something that needs a process tweak. Meanwhile, here again the best is enemy of the good and Fukushima needs a solution, even if imperfect, to the water problem. Indeed, if the bulk of the contaminants can be strained out by a filter, it sharply improves the effectiveness of the ion exchange columns, yielding a cleaner processed water. The problem of a big volume of contaminated filter medium has to be measured against the reality of close to a half million cubic meters of badly contaminated water. Concentrating the contamination makes it easier to manage. @netudiant: Agreed: colloids can be packed as solid waste, e.g. cast in concrete, just as the precipitates. The only problem will be a larger volume, due to the colloids containing much other, nonradioactive stuff. 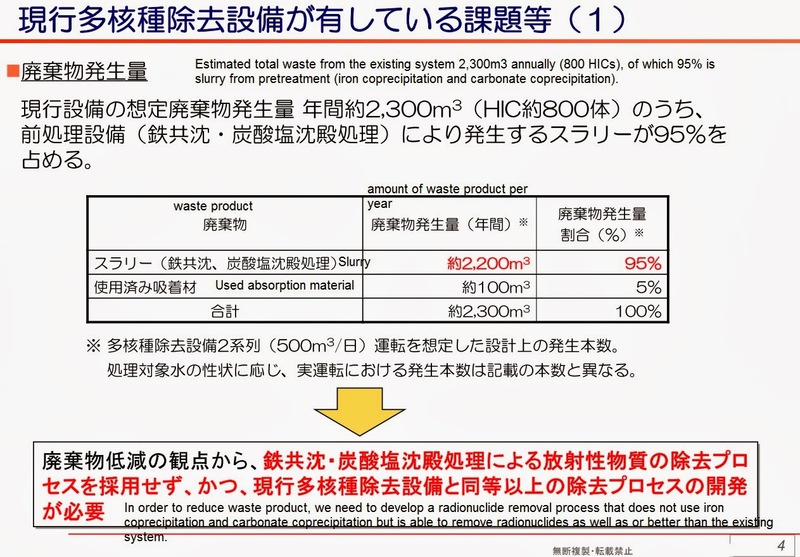 In any case, the product becomes essentially stable and harmless, whereas liquid waste tanks always eventually leak or otherwise develop problems (before Fuku, see e.g. Hanford and Sellafield/Windscale). 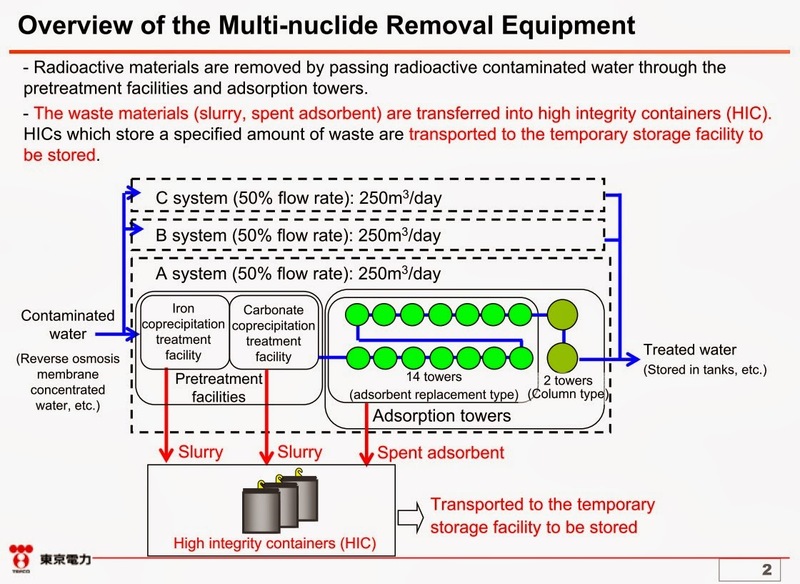 About the complete waste (including from decontamination): what about putting it on the Senkakus, solving two problems? Nice bit of work arevamirpal. Interesting that the system was for atom size radioisotopes that would not be caught by pre-filters but the larger 'particulates' would be. But what happened is the in-between sized 'colloids' make up the majority of the radioisotopes and are not caught in the pre-filtering (too small) and end up not be able to be removed in a ion sized seeking process...Oh well, back to the drawing board. Hanford has arrived at the problem that radioactive decay will breakdown the envisioned long term storage 'glass rod' in a short amount time during dry storage, I believe, putting them back to square one. But at least there the dregs have had the plutonium and uranium isotopes removed already, hasn't it? Gawd, I certainly hope so. I am not sure why spent fuel cladding tubes are expected to last 300 or more years inside dry casks, maybe they will not. I know dry storage casks are only guaranteed for about 50 years before having to be replaced, again. What a sorry state of affairs. How they are going to avoid having huge amounts of radioactive slurry leftovers, I don't know. If you concentrate the slurry it will become unstable. Might as well boil off the water then take the slurry add some boron and start pressing it into pellets and store in tubes like spent fuel. That way only capturing and separating out the gases like tritium would be the main problem which is all doable with existing technologies just very expensive. @12:14: How did you arrive at these conclusions? 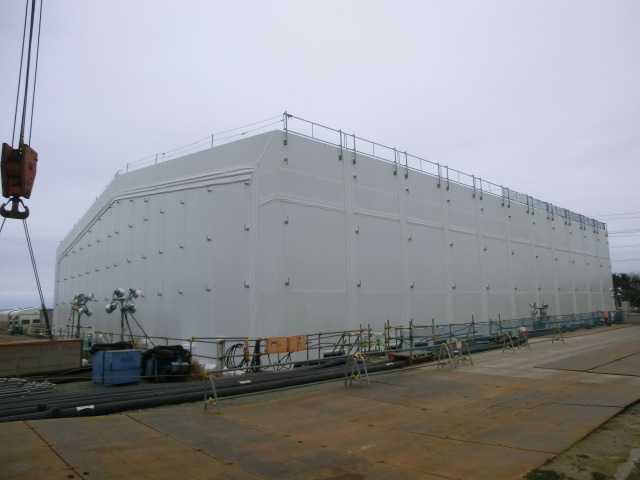 Finally, why should cladding / storage casks degrade? As long as they're stored properly (i.e. unless greed gets in the way), they should basically last "forever".